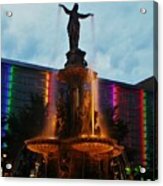 Fountain Square by Terri LeSaint-Keller - 8.000" x 7.750"
Fountain Square framed print by Terri LeSaint-Keller. Bring your print to life with hundreds of different frame and mat combinations. Our framed prints are assembled, packaged, and shipped by our expert framing staff and delivered "ready to hang" with pre-attached hanging wire, mounting hooks, and nails. 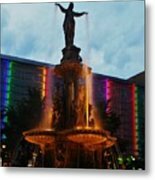 Fabulous photograph of an iconic fountain in downtown Cincinnati, with great colors, light, perpsective, and composition, Terri! F/L/Following!! I take it you know the area? Thanks for the kudos Morris! CONGRATULATIONS Terri! This wonderful image has been FEATURED on the homepage of the FAA Group No Place Like Home 6/02/2016. 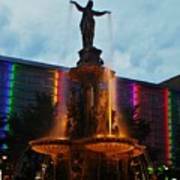 The Tyler Davidson fountain stands tall in the center of downtown Cincinnati. This is a gathering spot for many City Events, including concerts, kicking back to watch a game on the Jumbo-tron screen, or catching a quick meal at one of the food trucks.